We have nine shops in the South of England and the Channel Islands. They’re a really easy way to support what we’re doing to help some of the poorest children in the world, right on your doorstep. And with a great range of products, you’re bound to find something you like in them as well. 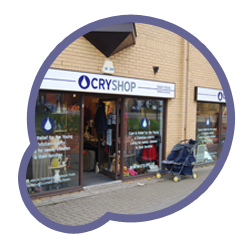 Drop into one of our nine stores, where every penny you spend goes to supporting CRY. And if you’re a regular shopper, pick up our CRY REWARD Loyalty Card - we’ll give you 10 points for every £1 you spend with us, and when you’ve collected 500 points we’ll credit the card with £5 to spend in store. It also tells us if you’ve signed up for Gift Aid (which allows us to claim an extra 25% on top of your donation), and if you’ve agreed to receive information from us we’ll send you regular updates on the value of goods you’ve donated to us as well. Our shops rely on a dedicated team of volunteers to serve customers and sort donations. Working with managers and deputy managers, you’ll get the opportunity to meet new people and do some rewarding work, doing your part to help poor children around the world. To find out more get in touch with your nearest shop directly - we would love to hear from you.